So many buzz words exist in education today. Just Google the phrase “educational buzz words” for a sampling! Or check out this critical thinkers guide to educational fads (preview only). Obviously some stand the test of time and graduate from fad designation to become truly worthy of educators’ attention. Two that hold the gold standard for the future are blended learning and integrated STEM. In fact, if used in tandem, no child would be left behind, so to speak! 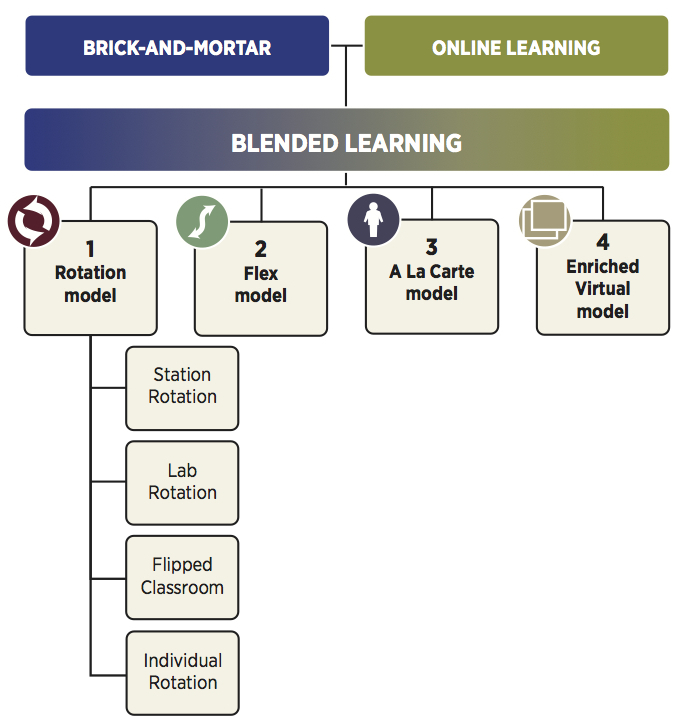 But blended learning is not the same as integrated STEM, and a good understanding about the differences between both helps teachers chart a path toward rich and engaging 21st century pedagogy. As you’ll see, these two should be working together in practice because of their similarities and novel approach toward education, but both are big changes in how we traditionally do school in the United States and require a sharp learning curve during implementation. Read on, dear teacher. It does not have to be overwhelming even though there is a learning curve. And it can work with your school’s required pacing guide and standards. It can also work with you going solo or working with colleagues. Going solo is easiest if you run an elementary classroom and teach all subjects to your kiddos. If you are a single-subject teacher, then you need to get your colleagues on board. In my practice as a second and sixth grade teacher, I’ve experienced it both ways. First, I became a blended learning classroom in second grade and later began sprinkling in integrated STEM units. When I became an ELA teacher for sixth graders, I worked with my team teachers who taught math, science, and social studies to pull off integrated STEM, but blended learning happened in my classroom regardless. Now that you have that background information, here is a little inspiration for blending. This is a video of my 2nd graders at Seward Elementary School (Alaska). What then, is integrated STEM and how does it contrast with blended learning? Moore et al. (2014) defined integrated STEM education as “an effort to combine some or all of the four disciplines of science, technology, engineering, and mathematics into one class, unit, or lesson that is based on connections between the subjects and real-world problems” (p. 38). Integrated STEM curriculum models can contain STEM content learning objectives primarily focused on one subject, but contexts can come from other STEM subjects (Moore et al.). Therefore, it is clear that by “blending” science, technology, engineering, and/or mathematics, we are not talking about a blended learning model of teaching. Blended Learning and integrated STEM are entirely different yet the two exist to complement each other beautifully. For example, blended learning isn’t just about online learning, as some think, but more about making space for real-world relationships and authentic learning. This is also the aim of integrated STEM, which uses a project- or problem-based learning approach that asks students to work together to create a solution and solve problems in the real world. Buzz: Design Thinking – Check it Out! The Design Thinking process, from Stanford University, involves five steps: empathize, define, ideate, prototype, test. In classrooms, students can learn to solve problems, invent, and create solutions by using the same process as the world’s inventors and thinkers. This sounds familiar to integrated STEM, doesn’t it? To help you imagine the classroom that uses both blended and integrated STEM, picture students going from station to station in your classroom. Each station focuses on a different aspect of the problem or project at hand. If you teach all subjects, the stations are arranged to include elements from all subject areas. For example, at one station students solve mathematical problems related to the project, while at another station students test prototypes that they built at yet another station. Still, another station students reflect in writing on what is and isn’t working in a class journals–adding on to what previous students said. A social studies station could have students analyze if their solution is adaptable to different cultural approaches, offers alternative explanations and solutions, and is feasible given regional differences. Using stations as a way to organize the learning promotes inclusion of experts from local businesses. Imagine having an engineer present at the design station once a week and a journalist regularly overseeing the technical writing that accompanies the project. Enjoy your journey toward empowering STEM learning! Mapping STEM into the Curriculum , Jo Anne Vasquez, Ph.D.
Elly Ray is a retired teacher who now actively advocates for changes in the way we do school. Her passions include integrated STEM as the base curriculum in schools and leading girls, women, and other minorities toward STEM careers. She created Ed on its Head because she believes education needs to be turned upside down (onto its head), flipped over, reworked. In 2019, most schools in the United States still follow the “factory model” from the industrial revolution era, and this just doesn’t work any longer. Student apathy and other indictors have been well researched to substantiate this claim. Learning environments today should be authentic, collaborative, interdisciplinary experiences that give meaning to learning and thus engage students. As an educational consultant whose focus is integrated STEM, she can work with your district, school, and/or teachers or speak at your next event. Please use the contact form and reach out to her today!